A unique piece of history will soon arrive in Estacada. In honor of the 100th anniversary of Estacada Funeral Chapel, a replica of President Abraham Lincoln's coffin will be on display at the chapel at 110 First Ave. from Friday, Feb. 15, through Thursday, Feb. 21. Those who wish to see the coffin can stop by the chapel from noon to 4 p.m. Saturday and Sunday, and 9 a.m. to 5 p.m. Monday through Wednesday. To come by outside of those hours, call 503-630-3829 for an appointment. Estacada Funeral Chapel owner Rob Gaskill is excited about the opportunity to connect community members with a piece of the country's history. "What a great thing to celebrate the 100th anniversary of this funeral home and see how things were done back then," he said. Gaskill partnered with the Batesville Casket Company of Indiana to bring the coffin to Estacada. It's one of five replicas made by the casket company, four of which travel around the U.S. The fifth is part of the permanent collection at the Abraham Lincoln Presidential Library and Museum in Springfield, Ill. The traveling replicas have been to more than 100 cities. The replicas are based on an 1865 photograph of Lincoln lying in state. According to information from the Batesville Casket Company, Lincoln's coffin was elaborate for the era and was constructed of solid walnut, lined with lead and covered in black cloth. It was also decorated with sterling silver handles and studs lined across its sides, and featured a removable two-part top. In April 1865, Lincoln was fatally shot by John Wilkes Booth at Ford's Theater in Washington, D.C. After a funeral and several public viewings in Washington, he was brought back to his home in Illinois for burial. Large funeral processions were held at each major city along the route, and in May, Lincoln was buried in Oak Ridge Cemetery in Springfield, Ill., with his son, Willie. Iljia Rodev, director of research and development for Batesville Casket Company, led the the effort to create a replica of Lincoln's coffin in response to a request from an Illinois museum. 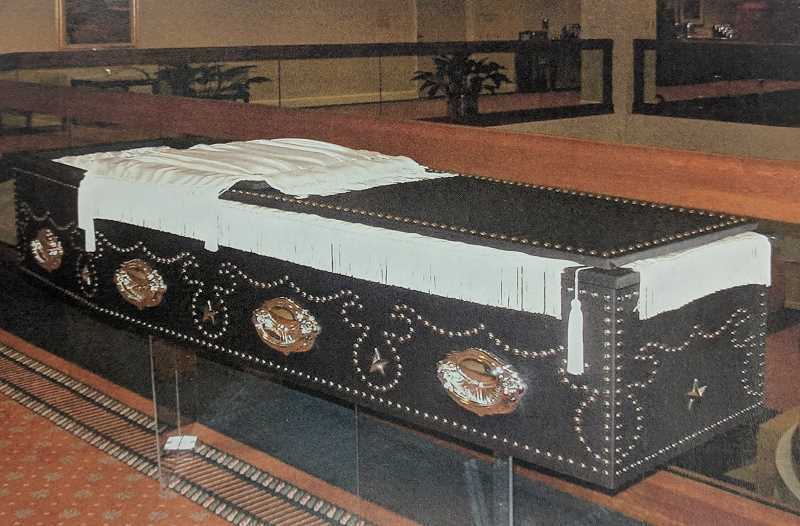 After the state funeral association released the exact dimension and materials of the coffin in 1993, Batesville created the replicas.